Mr. Chancellor, a respected business leader, an influential proponent of responsible corporate governance, and a torchbearer for learning and research – these are the hallmarks of the enduring career of Stephen Jarislowsky. After completing a Master’s Degree in Business Administration at Harvard University, he founded Jarislowsky Fraser Limited in 1955, and directed the growth of the company to become one of the largest, most trusted, and most successful independent investment firms in Canada. Now in his 91st year, he remains Chairman of the Board and reports to the office every day. Throughout a business career that has included directorships on numerous corporate boards, he has been renowned as a relentless advocate of shareholder rights, and as a fierce defender of business ethics. He has exemplified his commitment to high fiduciary standards in countless ways, but perhaps most convincingly by his role as a co-founder of the Canadian Coalition for Good Governance. Mr. Jarislowsky has also been a philanthropic leader with a particularly strong interest and belief in the power of education to create dynamic, just and democratic societies. To that end he has endowed eighteen research chairs at universities across Canada in a diverse range of disciplines. 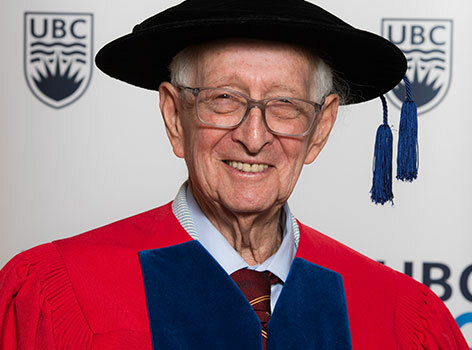 I am pleased to note, Mr. Chancellor, that this university is among those he has chosen to support, in the form of the Harold and Dorie Merilees Chair for the Study of Democracy in the UBC Faculty of Arts, and as a member of the advisory board of the UBC Centre for the Study of Democratic Institutions. His work and reputation have garnered numerous awards, including honorary degrees at 11 Canadian universities and appointment as a Companion of the Order of Canada. Mr. Chancellor, in recognition of his contributions to business ethics, responsible corporate governance, and indeed, to the people of Canada, I ask you to confer the degree Doctor of Laws, honoris causa, upon Stephen A. Jarislowsky.